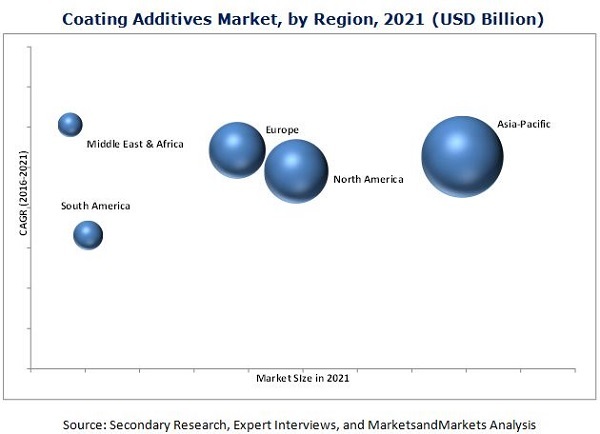 The market size of coating additives was USD 6.39 Billion in 2015 and is projected to reach USD 9.19 Billion by 2021, registering a CAGR of 6.1% between 2016 and 2021. In this report, 2015 is considered as the base year and forecast period is between 2016 and 2021. The value chain of coating additives include raw material manufacturers such as SABIC (Saudi Arabia), Allnex (Belgium), ExxonMobil (U.S.). Additives are manufactured by various players in the industry such as BYK-Chemie (Germany), BASF (Germany), AkzoNobel N.V. (Netherlands), Arkema (France), and Evonik Industries (Germany). The manufactured products are then used by the formulators or paint/coating manufacturers to achieve desired property for their products. Thus, the formulators develop, manufacture, and package the finished product, which is then distributed to its end-use application through logistics service providers. Some of the major paints/coatings manufacturers are DuPont (U.S.), Sherwin-Williams (U.S.), and The DOW Chemical Company (U.S.). Companies such as Nexeo Solutions (U.S.), Univar (U.S.), DKSH (Switzerland), Brenntag Group (Germany), and Connell Brothers (U.S.) have their presence and warehouses covering a wide region across the globe, which has helped them in becoming the key players in marketing and distribution of chemicals. These companies dispense their products to various automotive, construction, industrial equipment, and wood & furniture companies for end-use purpose. This report categorizes the global market of coating additives based on type, formulation, function, application, and region. The global market size of coating additives was USD 6.39 Billion in 2015 and is expected to reach USD 9.19 Billion by 2021, registering a CAGR of 6.1% during forecast period. The Asia-Pacific region dominated the coating additives market in terms of both volume and value. The increasing demand from the architecture, automobile, industrial, and wood & furniture industries in China, India, and Japan is driving the coating additives market. The major types of coating additives covered in the report are acrylics, urethanes, metallic additive, and fluoropolymers. Among the various types, acrylic additives capture major share of the market, in terms of volume, followed by urethanes, metallic additive, fluoropolymers, and others. The fluoropolymer coating additives market is expected to witness highest growth rate in comparison to other types, as they provide excellent protection against chemicals, abrasion, temperature, and corrosion among others. Rheology modification function will dominate the coating additives market during the forecast period. Rheology modifying additives are used to impart optimal fluidity and functionality to the surface. The rheology modifiers help to have better finishing of the coating surface. Water-borne formulations dominate the market among all the formulation types. With increasing environmental regulations, the market share of coating additives for solvent-borne system is decreasing. The demand is shifting toward the water-borne and powder-based coating additives due to stringent environmental regulations. However, solvent-borne is still being significantly used in Asia-Pacific and South America though its use has drastically reduced in Europe and North America. Architecture is the major application of coating additives. The growing commercial and residential construction in Asia-Pacific is driving the demand for coating additives for better protection of buildings. 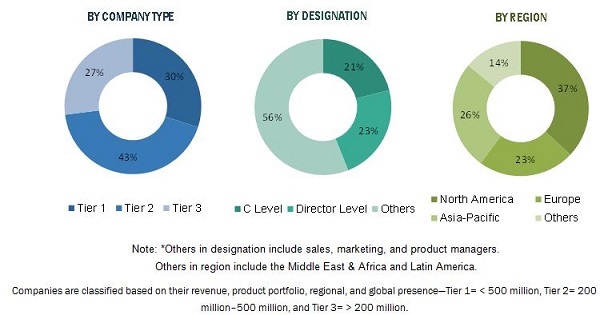 In addition, the growing automotive sector in regions such as Asia-Pacific and South America is catalyzing the demand for high-performance coating additives. The industrial discharges or solid waste (equipment cleaning waste, off-specification product, or emission control dust) of paints and coating materials interfere with the local sanitary sewers that lead to the discharge of pollutants into local waterways. The rising concern for the protection of environment may hamper the growth of the coating additives market. In India, The Environment Protection Act, 1986 mandates the treatment of paints and other pollutants, which exerts pressure on the manufacturers and requires them to invest in developing environmental-friendly products. The coating additives market is mostly dominated by established chemical companies. Intense R&D is the key to capture market share. Players such as BYK-Chemie GmbH (Germany), BASF SE (Germany), Arkema SA (France), AkzoNobel N.V. (Netherlands), and Evonik Industries (Germany.) accounted for the major market share. The major players are continuously executing a number of developments such as expansions, new product launches, and contracts & agreements to strengthen their foothold in the market and capture additional market share. 13.9 Momentive Performance Materials Inc.